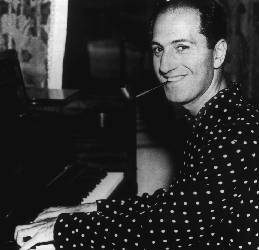 George Gershwin is perhaps one of the best-known but most misunderstood of all composers. His association with the world of popular music has led many to underestimate his genius as a composer. Everything he wrote, from his show-tunes to his concert works, bears his unmistakable hallmarks: intelligence and warmth coupled with irresistible and infectious vitality. The same qualities pervaded his piano-playing, which was spectacular not only on a technical level but also for its sheer inventiveness; the improvisations with which he happily regaled New York party-goers in the 1920s and 30s - some of which, fortunately for us, he recorded on 78s and piano-rolls - are amazingly intricate, miniature masterpieces of harmony and rhythm, full of the life and humor of the man. According to a friend, Gershwin played "with that delightful zest and relish. There was a naive honesty of enjoyment about him at the piano..." Gershwin never tired of performing, whether to an audience of one or thousands. According to Rouben Mamoulian (first director of Porgy & Bess): "George loved playing the piano for people and would do so at the slightest provocation... I am sure that most of his friends, in thinking of George at his best, think of him at the piano. Ive heard many pianists and composers play for informal gatherings, but I know of no one who did it with such genuine delight and verve. George at the piano was George happy." George Gershwin was born on 26th September 1898, the second of four children of Morris and Rose Gershovitz, Russian immigrants who had settled in New York in the early 1890s. As a child he seemed more interested in playing and fighting in the street than in anything musical. It was therefore with complete astonishment that his family listened to the 12-year-old George strumming out a popular tune on their newly acquired second-hand piano originally intended for the eldest son Ira. A mere 3 years after this he secured a job in New Yorks famous Tin Pan Alley as a "piano-pounder", demonstrating songs to music-hall performers and singers. It was here that he honed his skills as an improviser, creating elaborate arrangements to enliven the often uninspired tunes he was employed to plug. Although there are no acoustic recordings of Gershwin at this time, fortunately for us he did supplement his income by cutting piano-rolls, beginning as early as 1915. These ebullient and complex early Gershwin piano-roll arrangements give an indication of his extraordinary keyboard prowess, and this only a few years after his first introduction to the piano; to reach such a level of pianistic skill in such a short time is staggering. In 1917 Gershwin began working as a staff composer for the influential publisher Max Dreyfuss. In 1919 he wrote his first full-length Broadway show, La, La, Lucille, but the real turning-point in his career came at the end of 1919 when he played his song Swanee to the famous singer Al Jolson at a party. Jolson was impressed both by the song and the verve with which Gershwin played it, and he immediately recorded it; the recording sold in millions, and almost overnight George Gershwin became a household name. Gershwins career subsequently followed two parallel paths. With his brother Ira supplying the lyrics, he wrote a steady stream of highly successful scores for Broadway shows, including Lady Be Good! (1924), Oh, Kay! (1926), Funny Face (1927), Girl Crazy (1930), and Of Thee I Sing (1931); at the same time he began to acquire a remarkable reputation in the concert hall when, 10 months before the opening of Lady, Be Good!, he had a smash hit with his Rhapsody in Blue. In the wake of this success his Concerto in F was commissioned by the New York Symphony in 1925. Four more concert works followed: An American in Paris (1928), Second Rhapsody (1932), Cuban Overture (1932), and Variations on I Got Rhythm (1934), each one breaking new ground in terms of mastery of composition. Gershwins work in the opposing worlds of the musical theater and concert hall were eventually united in his masterpiece, his opera Porgy & Bess, completed in 1935. The whole of Gershwins vast experience in the theater, in song-writing, and in orchestral composition was brought to bear on this, the greatest achievement of his life. Based on DuBose Heywards novel Porgy, the opera is now recognised as one of the greatest masterpieces of 20th century music. Such songs as Summertime, I Got Plenty O Nuthin and It Aint Necessarily So assured its immediate popularity, but equally important to the work are the great choral and orchestral scenes, the unifying sections of recitative, and the numerous musical motifs on which the whole work is based. The first performance in New York received a 30-minute standing ovation, and at the lavish party in Harlem that followed, Gershwin entertained the guests until dawn with a reprise of most of the opera - where else but at the piano! Porgy & Bess had whetted Gershwin's appetite for more ambitious plans, and although he had been lured to Hollywood in 1936 - where he wrote some of his greatest songs for films starring his old friend from Tin Pan Alley, Fred Astaire - he was keen to return to New York to bring into fruition his plans for more concert works: a string quartet (already complete inside his head but not written down), a symphony, and another opera. Alas, he was never given the chance. Early in 1937 Gershwin began to suffer severe headaches and dizzy spells, and by July he had lapsed into a coma; an emergency operation disclosed a brain tumor. He died the morning after the operation at the tragically early age of 38. Only a few months earlier he had written to his old friend Mabel Schirmer: "perhaps dear Mabel this is our year. A year that will see both of us finding that elusive something that seems to bring happiness to the lucky....So sweet Mabel lift your glass high with me and drink a toast to two nice people who will, in a happy state, go places this year." Read more about Gershwin's remarkable piano playing here. Read about and listen to Gershwin's neglected masterpiece Second Rhapsody here.